As Disney Dreams! began to be talked about more and more, it was revealed that the nature of the show allowed for scenes to be taken in and out. This lead to speculation of seasonal changes for various holidays. This of course has happened over the Magic Kingdom at Walt Disney World, where the show Celebrate the Magic frequently receives additional scenes for various holidays. Then, the day came. It was announced that Disney Dreams of Christmas would not be an additional scene, rather an entire twenty-minute show all to itself. This was further hyped by Disney’s California Adventure in Anaheim’s announcement of a Winter Dreams! show as a festive version of World of Color. A few weeks later, an image appeared of the Disney Dreams! creative team standing outside London’s Abbey Road studios. Various visuals surfaced, including visuals of Tinkerbell superimposed on the castle, and that of Anna and Elsa. Disney Dreams of Christmas was beginning to take shape in our minds; and on the castle itself as programming really got under way. On Friday 8th November, Cast Members got a sneak peek of the show in its entirety and on Saturday 9th November, the lucky invited press (and Disneyland Paris bloggers!) got to see the show. Obviously the show leaked online almost immediately. After careful deliberation, and consultation with my twitter followers, I decided to watch the show on YouTube. Wow. I was rendered speechless immediately following the show. After a second viewing, I felt much more able to bring myself to post a reaction. My reactions are posted here, scene by scene. Of course, a huge SPOILER WARNING is to be placed on the rest of this article. Opening: The show opens with a chilling, festive version of Carol of the Bells, as the music gets grander, and more festival magic scene is unveiled before our eyes, as we move into our first featured film of the show: Fantasia. In snowflakes, various classic Disney scenes are represented, with some more traditional friends taking centre stage: Mickey, Donald and Goofy. What is so fantastic about this scene is the transition from the initial, quiet calm and peaceful Christmas to the grander, importance of the event. As the scene moved from the 0 second mark, it gradually built up the pace and the anticipation of what was to follow. Introducing Christmas: Our host for the evening is introduced, a Disney favourite already (and his film isn’t even out yet), Olaf. The castle is beautifully lit and projected onto, in fact a more perfect lighting of the castle will be incredibly hard to find. The use of projections and Christmas ice castle lights here is perfect. As in Disney Dreams!, a secondary character is used in order to translate Olaf’s speech into French, in this show Anna is used.This section is used to introduce the character, and Christmas in general. 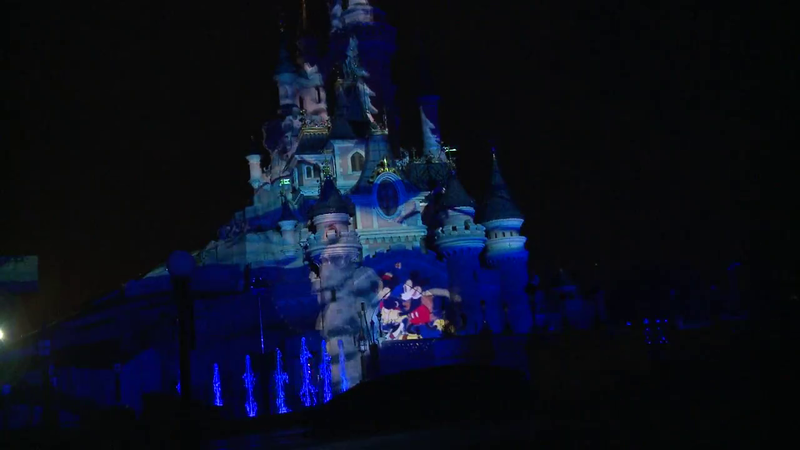 The projections onto the castle looks beautiful, and the song choice is good. We then move into another featured film, Bambi. It’s only a short clip, but manages to fit the context very well and transitions well into Mickey, Minnie and Donald.The transition projections worked very well to a radically changing type of music and theme. Frozen (Let it go): This is the emotional piece of the show. Elsa (Idina Menzel) sings Let it Go from the upcoming Disney Animation Studios film Frozen. Perhaps this section is slightly too short, but the projection and pyrotechnic effects look fantastic. It really does help build hype for the film, and I really felt an emotional connection to the piece; which ultimately is a sign of a job well done. It’s a Small World: It was quite comical to see Olaf in 2D animation on a Christmas card. The idea of seeing how Christmas is celebrated across the world is a fantastic idea, especially here in Europe where we have many different cultures visiting one park. It really felt like a nice educational, yet entertaining section. The music here tugged at my heartstrings, as did the meaning of the segment, which was that of peace, the word appearing in multiple languages on the castle affected me in a way that I didn’t imagine it world do. The animation style obviously matched that of the It’s a Small World attraction. Toy Story Nutcracker: The big comedy section of the show, which was clearly designed for laughs. And laughs it got. I felt this was timed quite well after what was a heavily sentimental and meaningful section. It was introduced by the second star becoming the ‘wishing star’. After a short introduction segment by the Toy Story characters (ripped right from the Toy Story 3 teaser trailer), it was time to launch straight into the Nutcracker. What pleasantly surprised me was the various uses of the music, which I found to be very clever. As Woody and Jessie dance together, the traditional Nutcracker suite gets a country feel to it. It was the middle segment which sent me into tears of laughter. Seeing the little green aliens and Rex dancing to the suite was hilariously funny. 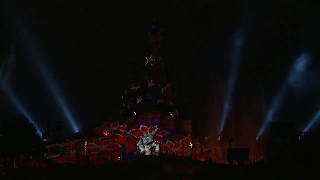 Spanish Buzz and Jessie appeared which featured the visual highlight of this segment with its castle projections. The segment ended with the Toy Story characters leaping in slow motion across the castle, this is sure to delight guests day after day during this Christmas season. Jingle Bells Sing-a-long: For me this was the highlight of the show. I can easily visualise families singing along to this each night. What I found striking was the use of pyrotechnics; the way they were used with this particular arrangement of Jingle Bells made the entire piece feel grand (which is should do, as in a sense it is the shows finale), and adds excitement. The use of language also impressed me, quite often things in Disneyland Paris are presented in either French or English; this section of the show was presented in many different languages promoting learning languages whilst providing guests from each nation to sing their bit just that little bit louder. We finally meet Santa Claus, the music begins to build and we see our favourite characters in baubles, whilst pyrotechnics are going off. (Much like the Disney Dreams! finale). Suddenly LED lights begin to turn on in the trees in Central Plaza, and on the garlands on Main Street USA. Disney Dreams! has finally become a 360 degree show, lights can be seen in all directions, the show has literally jumped from a castle show, to incorporating all of Main Street. Post-Show: The pyrotechnics have gone off, the projections have finished. The castle has gone black. But wait… there’s more. In an incredible post show twist, Disney have saved some of the best projections. Olaf reminds us to make sure we’ve got all our belongings. Colour fills the castle and street, it’s become a celebration. Then, the lights turn on and it’s all over for another night. Overall thoughts: The music used is simply stunning. I cannot think of a better arrangement of classic Christmas songs (mostly used in links) to suit the show more. The film Frozen is not yet out in cinemas, Disney have obviously realised this and introduced all the characters in a very easy to understand way, meaning that none of the show is lost on the audience from Day 1. 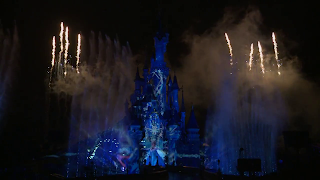 The projection effects even outperform those featured in Disney Dreams!, the teams who have worked on the show deserve a huge congratulations. 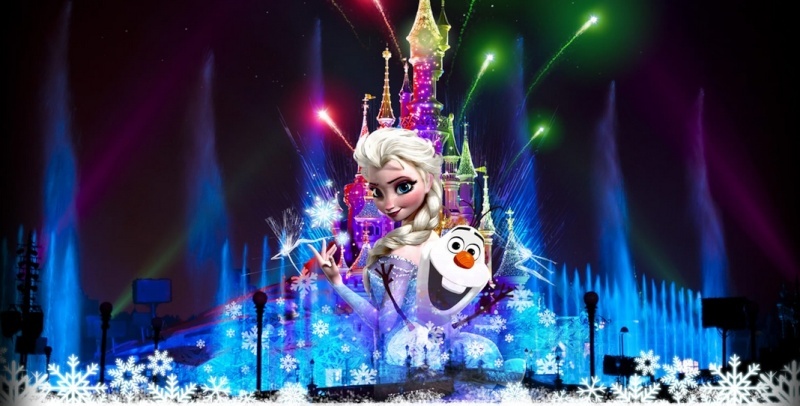 Once again, by launching Disney Dreams of Christmas, Disneyland Paris have affirmed themselves as a world leader in seasonal celebrations. This is one show we’ll be enjoying for years to come. Isn’t it great to not just be on the map, but leading the game? Disney’s Enchanted Christmas runs from November 10th 2013 until January 6th 2013. Disney Dreams of Christmas will run nightly at closing time.